The project date is subject to change. Clean Water Services bought the property to restore the creek. For a good part of the 20th century, Balm Grove was a popular spot for summer recreation along Gales Creek, just a few miles west of Forest Grove. At some point — officials aren't exactly sure when, although Clean Water Services believes it was in the 1930s or earlier — a small concrete dam was installed on the creek. Its purpose was to create a "swimming hole" in the creek for people to enjoy. However, what perhaps wasn't considered at the time was that the dam created an impediment to fish that could otherwise use the creek as a spawning ground and natural habitat. Clean Water Services purchased the 12-acre property where the Balm Grove Dam stands on Gales Creek in 2016. Now, engineers are working to determine the best way to remove the old dam and restore the creek as a natural habitat — without unleashing pent-up sediment and water in a way that would do even more damage. Tentatively, the agency is planning to do that work next summer, when Gales Creek is at its seasonal low point, although Clean Water Services spokeswoman Jessica Bucciarelli noted that date is subject to change. "There have been conversations for many years about the return on investment that we would get by removing this if we, as a community, had an opportunity to do it," said Bucciarelli. Abbey Rhode is the lead engineer working on the Balm Grove Dam project. 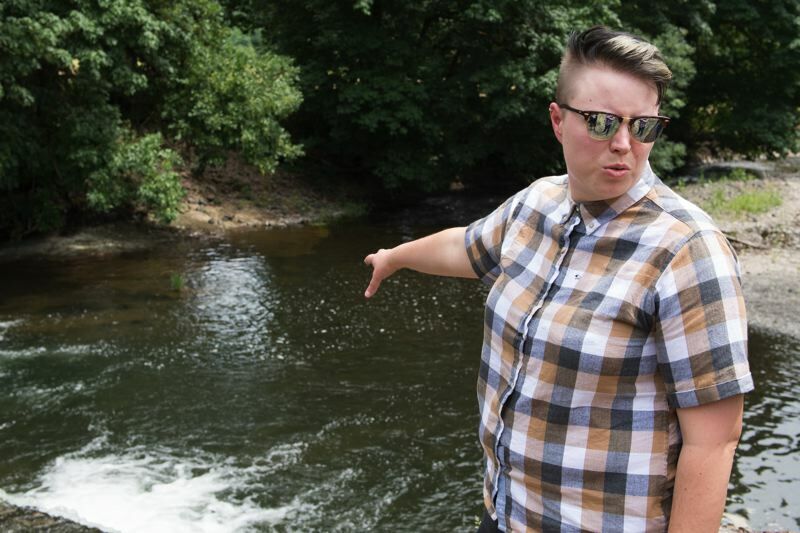 She has studied dam removals elsewhere in the Pacific Northwest, and she is conducting modeling on different scenarios to figure out how to move forward with removing the Balm Grove Dam. "What we find ... (is) that you don't generally see the sediment move that far once you remove the dam," Rhode said, referring to the sand, silt and gravel that has accumulated above the dam. She added, "We think the changes are going to be fairly local." But Don Hennig, an engineer by trade who lives in Gales Creek and owns property upstream from the dam, isn't sold on the project. He is all for stream remediation, he said, but he believes the best approach may be to simply let nature take its course — quite literally. "It's self-resolving — if they defer the project to next summer, which is the schedule ... I'll predict it'll wash itself out this winter," Hennig said. "Which is probably good, as long as the whole structure, or large parts of it, don't go rolling downstream, with the two bridges the next mile or so." He pointed to a collapsed part of the bank on the west side of the creek. "In any event, they're gonna have a channel here real quick," Hennig said. The Balm Grove Dam stands about three feet high on Gales Creek, with a substructure of unknown depth beneath it; engineers estimate it consists of some 250 cubic yards of concrete, according to Bucciarelli. In addition to the main dam structure, there are also concrete retaining walls on both banks of the creek overlooking the dam. Below the west retaining wall is where the erosion Hennig pointed out has taken place. "We'll remove all of the concrete," Rhode said. Asked about Hennig's concerns about dam debris washing downstream, Bucciarelli responded, "The dam material will be contained and controlled during construction, and then it will be gone." She added, "Our studies therefore don't address a 'big chunks of dam in the water' scenario." Clean Water Services wants to restore the creek to something more like its natural state. Bucciarelli and Rhode said that could potentially involve a second phase, after the dam is removed, to improve downstream conditions. Studies have shown that salmonids — like salmon and trout — respond well to the placement of large pieces of wood in the streams they inhabit, as they create shade for the fish and generate water conditions that are ideal for spawning. That is something Clean Water Services could do along that stretch of Gales Creek after the Balm Grove Dam is removed. "What blows me away about this is that it's such a small dam — the removal of it, I mean, we have to do it very, very carefully, but it's not like the Elwha or something, it's not one of these huge dam removals — and it's going to connect ... some of the best stream we have in this county upstream from here with downstream," Bucciarelli said. "We've got winter steelhead, coho salmon and cutthroat trout that, to varying degrees, have difficulty traveling in either direction across this dam." Hennig has lived in Gales Creek for decades. In that time, he said, he has seen the creek "migrate" across several acres, changing its course through the valley. Without anyone actively filling in the channel that has formed in the past to the west of the dam, he said he doesn't think the dam will be a barrier for much longer. "What's going to happen naturally is probably as good as anything they could do," Hennig said. "I generally approve of mitigation. ... It's just that maybe the expenses should be deferred for a couple years to see what happens naturally. Nature heals itself." Balm Grove hasn't been much of a recreational hotspot for many years. An old roadhouse near the dam has long since been shuttered, and outbuildings on the 12-acre property now owned by Clean Water Services have all been removed. The land was overgrown, including with invasive species like Himalayan blackberry, before what neighboring property-owner Brian LeClair described as large group of workers with weed whackers came out to clear it, after its acquisition by Clean Water Services. Transients have set up camp there more than once, but LeClair said neighbors have been discouraging them from staying. Even still, LeClair said he has "mixed emotions" about Clean Water Services' plans to remove the dam. "I don't know. That dam has been there for so long. I guess I'm on the fence about it — or maybe I'm on the dam," LeClair joked. "But I do want to see it back to its natural habitat, you know. And it would be nice to see it be some kind of park for kids and stuff again, because it's a nice area. ... I think it's got lots of potential, and if it just stays in the public's use somehow down the road, where everyone can get back to enjoying it, that would be really cool." Gales Creek is served by one of Washington County's Community Participation Organizations, a group meant to represent residents, provide their input to county officials and disseminate information about what is happening in the area. Chas Hundley, CPO 13's president, told the News-Times the group "has no formal opinion one way or another regarding the project." "We honestly haven't had much interaction," Hundley said in an email. However, he added, "I know many community members would like to see the Balm Grove property return to its roots as a community park, which has been discussed at our CPO meetings in the past." Bucciarelli admitted that Clean Water Services has not done a lot of engagement with CPO 13 yet. Officials plan to reach out to the CPO more later this year, she said. But after the planned dam removal, the future of the Balm Grove area might end up being out of Clean Water Services' hands altogether. The agency's main function is as a water management utility, handling sewage and storm runoff. It does operate a natural area that is open for recreational use in Forest Grove, a former sewage lagoon site that has since been converted into a wetland area called Fernhill. But Fernhill is the exception that proves the rule — as Bucciarelli pointed out, Fernhill remains a functioning wastewater facility, with the wetlands providing a natural treatment for the water after it passes through a nutrient filter. "We're not in the park business, and whether the new owner would pursue public access — I mean, it's just too early to tell," said Bucciarelli, suggesting Clean Water Services could sell the 12-acre property once the dam is removed and the creek is restored to its satisfaction. "Whether the new owner would be a private entity, a coalition of public entities, we just do not know. But there will be a conservation easement in place so that what has been done only gets better, not worse." 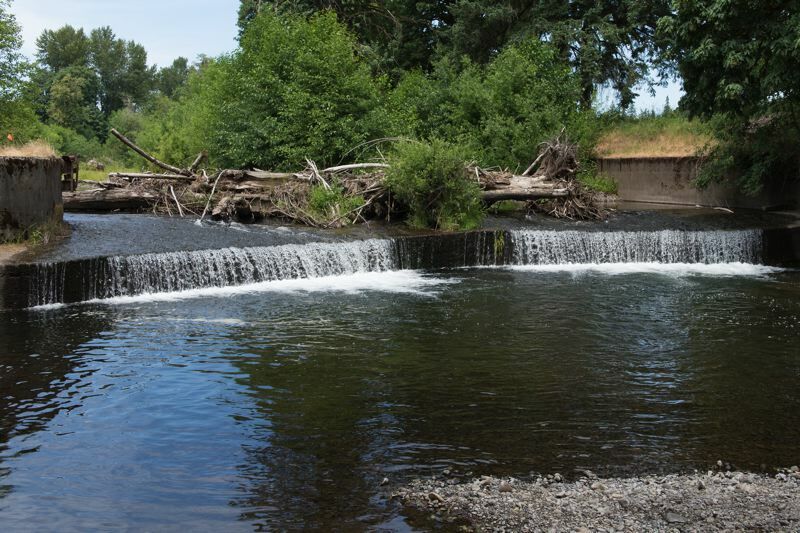 Among Clean Water Services' partners in the Balm Grove project are the regional government Metro, the Tualatin Soil and Water Conservation District, Tualatin River Watershed Council, Northwest Steelheaders, and Tualatin Riverkeepers. Metro and the Tualatin SWCD also helped provide funding for the purchase of the property. It may seem like just a small dam over a small stream in a rural area that receives few visitors — but Clean Water Services takes the project seriously. 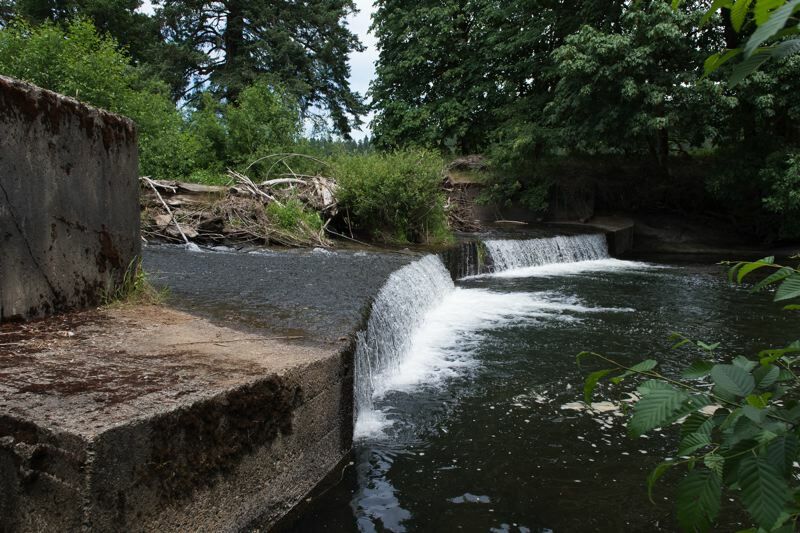 A factsheet predating the property purchase that Bucciarelli provided to the News-Times states in part, "Removal of the Balm Grove Dam is the single most important step that our community can take to benefit aquatic life in the Tualatin River Watershed." It describes Gales Creek's own watershed as containing "some of the highest-value, most intact fish habitat in Washington County," with the dam serving as "not only a physical impediment, but also (thwarting) fish passage by affecting water temperature and flow." But as eager as Clean Water Services and its partners are to be rid of the dam, Bucciarelli and Rhode stressed that project engineers are doing their due diligence on the project and working with neighbors. That includes conducting modeling of how an unconstrained Gales Creek will behave during "extreme events," like flooding on the scale of the 1996 and 2007 events that inundated Vernonia, about 25 miles to the north. "We make sure that, number one, you're not making anything worse," Rhode said. "I mean, that's really the big deal."